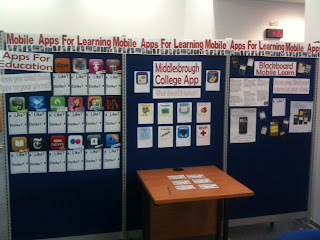 Our project for using Mobile Apps for Learning / Education is continuing and we are making some progress. I started the project a few weeks (months?) ago with the idea of looking at existing Apps that are out there and to see how they would be useful. For 1. I researched what was available and came up with a short list which I asked various staff, e-Learning and teaching staff to try out to see whether they are suitable. For 2. The new iPod Touch was a breakthrough as I am convinced that you need to have a camera to collect evidence so that you can edit and share it - collaborative learning. We have two iPod Touchs with Apps installed to test by users. Also a capital bid submitted for some iPads but I'm not sure if this will lead to anything. For 3. We asked students whether they would like a College App - the overall response was yes. They wanted the usual components - alerts, notifications, news, maps, images etc. and also to be able to access the library resources and their VLE courses. We use Blackboard as our VLE so our e-Learning Manager and e-Learning Technologist researched and investigated the Blackboard Mobile option. This would give us some general College specific sub-Apps plus access to Blackboard Courses. To find out from students what they think about these developments, we created a display in the LRC two weeks ago. (many thanks to our LRC Assistant Apprentice who has been brilliant in creating a fantastic display from my ideas and random scribbles!). The idea was that we wanted to know which general Apps students liked, what they thought should be included in a College App and also to give them information about what a Blackboard App would look like. Students can write on the display in the Like and Dislike grids. We also produced some cards for students to fill in. I asked approx 80 students in one morning to give their views on the display and fill in cards. Most were really positive and interested. The cards have been available since so I'm hoping that they will give us a good indication of what students would like including in an App. The plan is that we will have something available for September. I am doing some research into the use of microblogging by librarians and information professionals. I have created a survey using survey monkey and distributed it by direct message to some of my followers on twitter. There has been a very good response but if you haven't filled it in yet and would like to then here is the link. It only takes 5 mins and your responses would be appreciated. Thanks. Some don't "don't like Mondays"
For me it is fairly straightforward - Mondays are the worst days of the working week and Fridays the best. It has always been like this and for a variety of reasons for example difficult meetings scheduled, a particularly challenging Y10 class, the traffic, trying to get children ready and still get to work on time. Nowadays it is better and I have learnt to better manage my time, and wherever possible, plan tasks and activities for Mondays that don't fill me with dread at the prospect. There are positive aspects to this Monday morning dread - I suspect most teachers have it, I think it shows that you really care about what you do and that it means a great deal and you want it to go well. I still get this feeling now that I don't teach very much particularly after holidays when I return to work and hope everything is going to go well and that I can do a good job. The other positive is that Friday feeling, the euphoric feeling of the weekend coming soon. It's not that I don't like work, I like my job very much but the weekend is great and there is also relief that another week has been successfully achieved. If you don't feel the Monday you don't feel the Friday. However when talking to some of my colleagues in casual conversation I found out that this wasn't the case for everyone. For some, Monday wasn't the worst day. So I decided to ask everyone in my department which was their best and worst day. (There are 17 in my Learning Resources dept but only 13 were around on this day). Worst days. Monday 6. Tuesday 3. Thursday 2. Friday 1. Don't mind 1. Best days. Friday 10. Monday 1. Wed 1. Don't mind 1. There were a variety of reasons e.g. Tuesdays were considered better than Mondays as you still had some weekend positiveness left on Monday but none on Tuesday. However it was fairly conclusive that Friday was the best day so as a manager I started to think how I could use this to my advantage. Firstly we have department meetings once a month on Friday mornings and people are much more upbeat that if we hold them at other times. I introduce new ideas or plans on a Friday in an informal way so that people are aware of them and then circulate more formal details the following week. The 'feel good factor' is more apparent in the Learning Resources Centre as a whole on Fridays - students are more upbeat so I try to get staff to be more student focussed and interactive. Hopefully I'll be able to use this to my advantage in the future and plan activities to get the best out of everyone. We have been investigating Kindles for the last few weeks in order to have some available in the LRC for staff and students. We are always keen to increase the range of technologies that we have on offer to the students and the Kindles are definitely appealing. The issues that we wanted to look at were firstly how we were going to put the content on to the Kindles and what sort of content we should use. Secondly some security issues including the devices not being returned or just taken, or more importantly ensuring that borrowers could not buy content using our account. As far as the content is concerned, initially we have decided to use lots of free books including classics and fiction. We will allocate the Kindles to specific areas i.e. Sports or Health & Care or Computing & media and buy some specific books that are on reading lists or relevant to the course. Also documents and PDFs and research other e-book titles that are compatible. Once they are set up I expect we will get lots of requests for content. The security issue of being taken or not returned we are not going to worry too much about, we'll probably limit them to use in the LRC, then in the College and see how that goes. We have some security tape / tattle tape strips that I got for the net books so might use those which would set off the book security alarm but I've no idea whether it would affect the device if desensitised. I think it would be better not to desensitise them to be on the safe side. The issue of buying content on our account is the one that I have deliberated over the most. This is because once the device is registered and set up then it doesn't ask you for a password to buy from the Kindle store. We looked at the option of using a gift voucher for purchases as this would limit it and I'd been told that this was an option but couldn't get it resolved satisfactorily. Therefore we looked at the option of registering the Kindle, buying content on an Amazon account, then de-registering the device. I thought that once de-registered, the Kindle would lose the content but it doesn't. This solution seems to work. The only real problem has been the WiFi access in College - the Kindle finds the WiFi network and even connects to it in places but when you try to access the store, it fails. Presumably this is due to the proxy settings - there are no short term fixes. Therefore what we have done is buy four Kindles, register them all to one Amazon Kindle account on the PC, take them home and register using home WiFi, back to college and download content, some free and some paid for, the same content can go many devices (don't know exact number - I think it varies) via the PC and lead, then back home and de-register the devices using WiFi. The Kindles are now ready to use with content and without the option to buy unless re-registered. It is possible that users could de-register and register to their own account but I don't think it's likely or an issue. Next week LRC staff are testing them then after half term they will be ready to go out on loan. Hurrah! In our LRC we have 6 open access computers that are on 'stand up' tables and are available for students to log on to for 15 minute slots. These are walk up bookings rather than booking at the desk which you have to do for all the other 180 computers. They are popular and conveniently placed near the entrance. The 'tables' are slightly too high but this doesn't seem to cause a problem, no complaints. Yesterday I was visiting Newcastle University for a LibTeachMeet event. In the building, in the foyer area, were some 'stand up' computers and they looked brilliant. The keyboard was set into the glass topped 'podium' table top and you could see into the workings and the wiring. They had little groovy lights too and were just brilliant.